The old shabby lawn was replaced several months ago by new turf. The lawn was installed with the right soil underneath and has been watered and looked after. Why have these dead spot appeared recently? This can be common with over-watering. 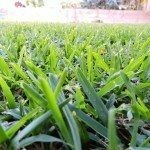 After the grass has recovered from transplant, unless you are experiencing a drought, then it will only be necessary to water if the rains have not been sufficient. I recommend applying wettable sulfur and dolomitic lime to the area to cure the issue. This will help greatly.